The sun was shining here today – really shining! It actually felt like summer! 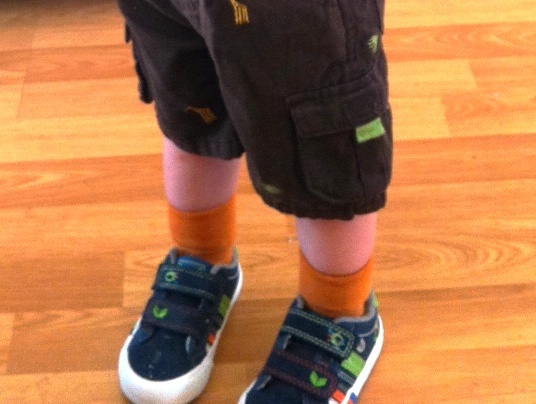 So I decided to dress Little Man in shorts in honour of the occasion. After all, who knows when he’ll get an opportunity to show off those lovely legs again! He was walking out of the room once I’d finished dressing him, when suddenly he stopped. Then looked at his legs. He pulled on his shorts. He was so puzzled, my poor Little Man. What kind of trousers were these? Broken ones obviously. Duh Mama! Oh that is very cute!! I haven’t even gotten any shorts for my little guy…he’ll be wondering what his knees are if he gets a chance to wear some!